The Foundation for Landscape Studies is pleased to announce the winners of the 2009 John Brinckerhoff Jackson Book Prize for recently published books that have made significant contributions to the study and understanding of garden history and landscape studies. The winners are listed in alphabetical order. 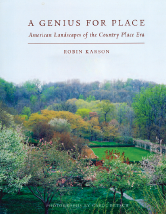 In this definitive and well illustrated volume on a formative period in the history of American landscape design, Robin Karson analyzes seven country places created by some of the nation's most talented landscape practitioners. From the 1890s until the advent of the second World War, new industrial fortunes made it possible for wealthy Americans to commission mansions and grounds emulating Italian villas and French châteaux. The landscapes of this Gilded Age, or "Country Place Era," as it is also called, reveal the diverse influences of continental stylistic traditions, the English Arts-and-Crafts movement, and the lingering design precepts of Frederick Law Olmsted. In the book’s chapters, the author traces a chronological progression from the naturalistic wild gardens of Warren Manning to the mysterious “Prairie-style” landscapes of Jens Jensen to the protomodernist gardens of Fletcher Steele. Other practitioners covered are Charles Platt, Ellen Biddle Shipman, Beatrix Farrand, Marian Coffin, and Lockwood de Forest Jr. The projects profiled follow a broad geographic arc from Stockbridge, Massachusetts, to Santa Barbara, California. All seven landscapes are now open to visitors. Analyzing these designs in context with one another and against the backdrop of professional and cultural currents that shaped larger projects – parks, campuses, and planned communities – Karson creates a rich and comprehensive picture of the artistic achievements of the period. Striking black-and-white images by landscape photographer Carol Betsch capture the considerable beauty these country places retain, while hundreds of drawings, plans, and historical photographs enrich our understanding of the original designs and the lives of the initial owners. Robin Karson is the founder and executive director of Library of American Landscape History. She holds a B.G.S. and an M.A. in the history of art and museum practice from the University of Michigan. Following an internship at the Mount Holyoke Museum of Art, she became a columnist for the Springfield Sunday Republican. She subsequently served as contributing editor to Garden Design and Landscape Architecture, writing frequently for those magazines on a wide range of topics. Her previous books are Fletcher Steele, Landscape Architect (author), The Muses of Gwinn (author), and Pioneers of American Landscape Design (coeditor). This richly illustrated color edition of the Master List incorporates new research conducted over the past twenty years. Searchable by project type and geographic location, it is an inspiring and invaluable tool for landscape history scholars and landscape preservationists. 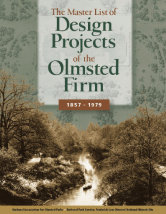 Expanded from an earlier version to include over 6,000 projects, the Master List is the only publication to categorize all of the Olmsted firm’s design projects so that the scale, type, and geographic diversity of the work can be quickly and easily understood. Lucy Lawliss, ASLA, is a cultural resources manager for the National Park Service and has written several award-winning historical landscape publications, including Olmsted in Georgia: The Residential Work of the Olmsted Firm 1895–1937. A board member of the National Association for Olmsted Parks, Lawliss served as the organization's co-chair from 2002–2005. She holds undergraduate and master's degrees in landscape architecture with a certificate in historic preservation from the University of Georgia and is a registered landscape architect. Caroline Loughlin, a founding board member and previous president of Forest Park Forever, is the coauthor of Forest Park, a history of St. Louis’s premier park. She is a board member of the National Association for Olmsted Parks (NAOP), serves on the steering committee of the NAOP-sponsored Olmsted Research Guide Online, and is the treasurer of the Friends of Fairsted, the Frederick Law Olmsted National Historic Site in Brookline, Massachusetts. She is a volunteer at Mount Auburn Cemetery and a member of the steering committee for the cemetery’s Preservation Initiative. Lauren Meier, ASLA, is a historic preservationist with Pressley Associates in Cambridge, Massachusetts, where she oversees a wide variety of historic landscape preservation projects. She was the founding coordinator of the National Park Service’s Historic Landscape Initiative in Washington, DC, and historical landscape architect for the agency’s Olmsted Center for Landscape Preservation. She holds a bachelor’s degree in botany from Pomona College and a master’s degree in landscape architecture from Harvard Graduate School of Design. Among her professional projects is the restoration of the landscape at Fairsted, Frederick Law Olmsted’s home and office in Brookline, Massachusetts, now a National Historic Site operated by the National Park Service. She is the author of numerous articles devoted to the preservation of historic plant material. She is a board member of the National Association for Olmsted Parks and a former chair of the research committee. Ruggles uses poetry, court documents, agronomy manuals, and early garden representations to immerse the reader in the world of the architects of the great gardens of the Islamic world, from medieval Morocco to contemporary India. Western admirers have long seen the Islamic garden as an earthly reflection of the paradise said to await the faithful. Such simplification, Ruggles contends, denies the sophistication and diversity of the art form. Just as Islamic culture is historically dense, sophisticated, and complex, so too is the history of its built landscapes. She follows the evolution of early Islamic agricultural efforts to their aristocratic apex in the formal gardens of the Alhambra in Spain and the Taj Mahal in Agra. This richly illustrated volume is a work of impressive scope sure to interest scholars and enthusiasts alike. 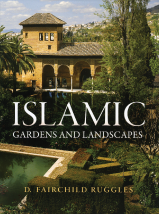 D. Fairchild Ruggles is a professor of landscape history at the University of Illinois at Urbana-Champaign and the author of Gardens, Landscape, and Vision in the Palaces of Islamic Spain. In her work, she examines landscape as a complex system in which agricultural practice, water management, and sites where local and exotic agricultural produce are traded are important aspects of culture. Ruggles holds a B.A. from Harvard-Radcliffe and an M.A. and Ph.D. from the University of Pennsylvania. Before coming to UIUC in 2001 as a Faculty Excellence hire, she taught at Cornell, Harvard, and Binghamton Universities. Near the end of her career, Dorothea Lange lamented, “No country has ever closely scrutinized itself visually. . . . 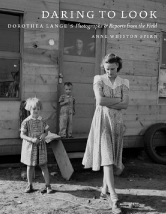 I know what we could make of it if people only thought we could dare look at ourselves.” Lange did look, unflinchingly turning her lens on the despair, degradation, and greed unleashed by the Great Depression. Her photographs for the New Deal’s Farm Security Administration have become the defining images of that time, capturing a country and a people on the brink of cataclysmic change. Lange viewed her photographs as part of sequenced narratives, contextualized and enriched by her descriptive captions – without which, she wrote, “half the value of fieldwork is lost.” Daring to Look presents never-before-published photos and captions from Lange’s fieldwork in California, the Pacific Northwest, and North Carolina during 1939. Lange’s images of squatter camps, benighted farmers, and stark landscapes are stunning, and her captions – ranging from simple explanations of settings to historical notes and biographical sketches—add unexpected depth, bringing her subjects and their struggles unforgettably to life, often in their own words. When Lange was dismissed from the Farm Security Administration at the end of 1939, these photos and field notes were consigned to archives where they languished, rarely seen. With Daring to Look, Anne Whiston Spirn not only returns them to the public eye, but sets them in the context of Langeâs life, work, and struggle for critical recognition, firmly placing her in her rightful position at the forefront of American photography. Anne Whiston Spirn, professor in the Department of Urban Studies and Planning and the Department of Architecture at MIT, is an author, photographer, landscape architect, and planner. Her previous books include the award-winning The Granite Garden: Urban Nature and Human Design (1984) and The Language of Landscape (1998). Currently she is finishing The Eye Is a Door, a book on photography and the art of seeing. "Knowing Where to Stand," an exhibition of her photographs, was on view at the MIT Museum in 2003–2004 and traveled to Vassar College in 2004. Since 1984 Spirn has worked on ecological planning and community design and development in inner-city neighborhoods. She directs the West Philadelphia Landscape Project, an internationally recognized program that has integrated teaching, research, and community service since 1987. Her next book project has grown out of this experience: Top-Down/Bottom-Up: Rebuilding the Landscape of Community.